Back in January Steve Gale kindly welcomed my new blog with a comment about a number of plants we are lucky to have growing in this area, including Ground Pine (Ajuga chamaepitys, left) and Cut-leaved Germander (Teucrium botrys, below) both of which are nationally rare. Well, yes and no! He was I am sure, referring to a small piece of chalk grassland just to the south of Banstead Woods called Fame's Rough, a cracking place for both wild flowers and butterflies. 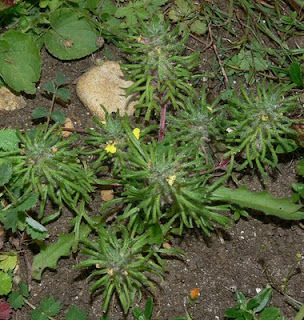 It has an interesting history which essentially boils down to the fact that in WWII the field was ploughed to grow crops (unsuccesfully) and for a few years after Cut-leaved Germander (among others) was common having only been previously recorded as an infrequent arable weed in the area. After a few years it disappeared only to reappear en masse when the land owner was persuaded to ploughed a strip of the field. For the next 30-40 years a new strip was ploughed every five or six years and the cycle repeated, often with both the above and many other ruderals (colonisers of disturbed ground) growing in huge numbers. Obviously the seed of these species is quite long-lived but they have little capacity to compete with other plants. For the past 10-15 years the ploughing has stopped and the field started to scrub over, a couple of years ago the scrub was cut back and a test was started to see how much soil disturbance was required for the germination of these species to occur. A number of areas were dug/scarified to varying degrees but not ploughed! The results were fairly disappointing with a few plants of both species appearing but no great numbers. Last year a larger area was lightly rotovated and a on recent visit I failed to find any plants of either species, so it appears it is ploughing or nothing. Hopefully this will be tried soon. 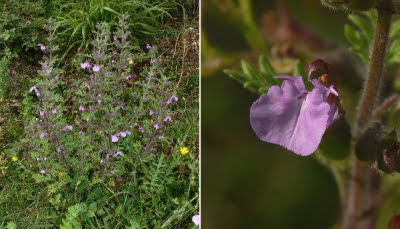 The two plants are interesting as well as rare, Cut-leaved Germander occurs at probably fewer than ten sites in the country and Ground Pine at only 32 sites since 1970. They are fairly closely related members of the Labiatae or Lamiaceae (or whatever), the mint family. but are instantly recognisable as they are members of the only two genera of that family in this country that have very little or no upper lip as the picture of Teucrium botrys below shows. You can read more about Ground Pine in an excellent dossier produced by Plantlife. The interest on Fame's Rough does not end with these two species, it is a joy to behold from spring through summer with many chalk specialist plants including orchids and is always well worth a visit. Finally, to get back to Steve's comment, yes, I am sure the plants are still there, if only as seed but; no, you'll be lucky to find them this year. I should point out the photos were taken a couple of years ago. I hope you are still returning to blogging because I have nominated you for a Kreativ Blogger Award. Thanks for the thought, as you can see I am back in the blogging mode!! Work has meant I have had little time recently!! !